I’ve been keeping a journal since I was a little girl and over the years, along with the journal where I spill out all of my thoughts and feelings, I’ve started other journals. I’ve got one for poetry where I write favorite poems and similarly I’ve got a quote journal. I’ve been lucky enough to do a bit of traveling and so my travel journals are always fun for me to revisit and remember places I’ve been to and adventures I’ve had. But in the past couple of years, the idea of visual journaling is something that has been really calling out to me. I don’t draw but I enjoy creating collages, using rubber stamps and just playing with paint. My journals sometimes have a page here and there where I add visual elements but that’s about it. So with the help of True Vision by L.K. Ludwig (which was a book I got for Christmas) I’ve decided to set aside one journal just for visual journaling. Here’s my first page. I wanted to do something to celebrate my first year of having an Etsy shop. So I thought why not use scraps of papers which I’ve used for the books that have appeared in my shop. In case you are wondering what book I’m using. I started a Moleskine journal because the pages are thick enough for paint, gesso and other mediums. I need to make my own journal but didn’t want to put this off any longer so I just used whatever I had on hand. It’s fun to see so many of the papers I’ve used. I really enjoyed doing this and am looking forward to how this book will turn out. How will my journaling change, if at all, what will I learn and on and on. How about you? Do you do any visual journaling? I don’t have the habit of writing journals but I don’t mind buying them as a collection, hehe. This is a great idea, Iliana! I love what you’ve come up with so far. Scrapbooking is the closest I’ve come to visual journaling. I’m not sure that counts though. I love what you did with your visual journal. I have the habit to start my day with a quick sketch, doodle or painting that I do in a journal. I add few thoughts and it is interesting how many times I get back to them, for ideas and time reference. When I do I remember how I felt that day. I also have other journals and sketchbooks that , like you, I use when traveling. I have one in my car in case I get stuck somewhere and small ones for my purses. I am using one right now with interesting pages (rice paper or hemp maybe) from Nepal for my watercolor. It is really different as it doesn’t absorb the water the same way as cotton. Anyway it is all fun fun fun and so vital to me at the same time. That is beautiful, Iliana! Like Wendy, I’ve done some scrapbooking, but no visual journaling. You are one talented lady! I am horrible about journaling…I’ve tried over the years, and I don’t stick with it. As far as scrapbooking, this will probably curl your hair, but I have no patience. I just can’t sit still long enough! This is something I’m just starting to get into as well. I am trying my hand at drawing and really want to get some paints to throw in there too. What a great start to your visual journal! 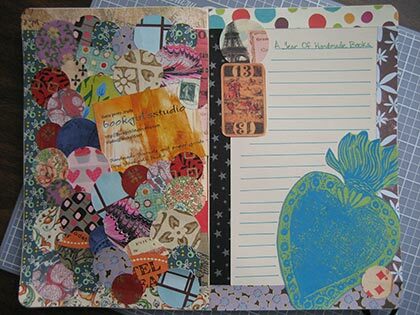 I’ve not tried visual journaling before and my regular journaling has crept into being only once in awhile these days. Between work and school and blogging I seem to have no spare time. When school is done I’m sure I’ll be a regular journaler again and who knows, maybe I’ll try a visual journal at that time too! Carrie K. – Thank you! Roxane Stoner – I think that’s wonderful that you start your day with sketching and journaling. How wonderful. Have you ever tried the book The Artist’s Way? I’m like you, I never walk out of the house without a journal in my purse. I’ve always got to have pen & paper. My husband does calligraphy and he worked on rice paper one time and the end result was really nice and a bit different from his previous work. Would love to see bits from your journal. Do you have pics on your blog? I love your journal. You are an exceptional artist! Thanks for sharing. That’s lovely!! 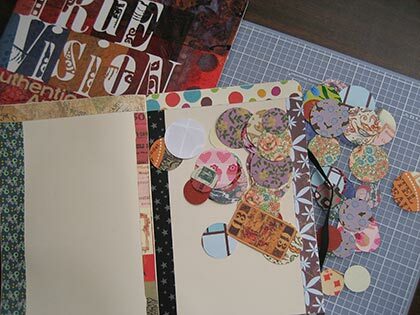 I scrapbook and I have used my scraps to make other things…my best project has been punching out squares from my scraps and then covering a clipboard with them. Then I covered it with decoupage glue (several coats) . I really like it and it makes me feel creative! Kathleen – Aw, thank you so much! Staci – Oh how fun! I bet that does look great. I love using things I’ve made – you are right, makes one feel a bit more creative. Now, do you use mod podge for decoupage? I use it but really like gel medium. This looks great Iliana – thanks for sharing! Like you I don’t draw but I do like creating collages with photos, pictures, paper etc… like you have done here. First yes I have gone twice through the Artist’s Way, once 18 years ago and then another time as a group online. We just finished our 12 weeks. First time around was really good it gave me the permission to be an artist that is I permitted myself and accepted my “curse”. The second time only reinforced how I have been living since. It was interesting to share the experience with other people but I didn’t have much to add to the group I am afraid. I will try to do another entry soon and let you know when I do. Like you I am never anywhere without a book, a pen and paper always been that way as long as I remember. So nice to have a husband that shares your love of books and talent in the arts. Really neat! I love that you can dedicate one journal each to a variety – I have attempted to have just one book for poems or quotes but I end up misplacing it and … well, I just do whatever with the one book at a time. Same with novels! I can only read one book at a time. Karen – Thank you. I’d love to see pics from your journal! I do lots of visual journaling and I love moleskins! I love what you have done here too. One more beautiful journal you’ve made. It looks great. Wow, this is gorgeous. You are so talented. 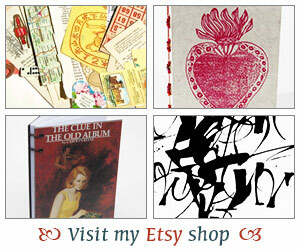 I bet you could sell journals like these in your shop too. I would buy them. Lovely…just lovely! Love it! I’ve done visual journaling at different times, using pen & ink drawings, colored pencil, gesso and paint, and collage with ephemera, but I’m not doing right now. You are inspiring me, though!